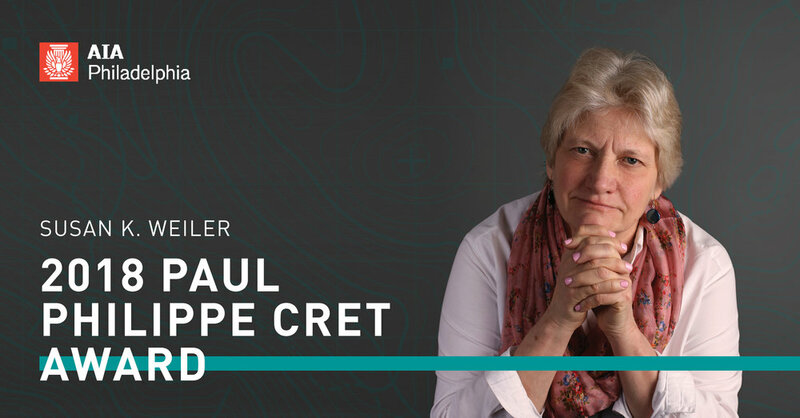 The Philadelphia Chapter of the American Institute of Architects has recognized OLIN Partner Susan Weiler, FASLA with the 2018 Paul Phillipe Cret Award. Named after the renowned 20th century Philadelphia architect, teacher, and design leader, the Cret Award recognizes individuals or organizations who are not architects but who have made an outstanding and lasting contribution to design of buildings, structure, landscapes and the public realm of Greater Philadelphia. Susan was nominated by colleagues for her visionary leadership in the planning and design of landmark civic, cultural, and educational places throughout Philadelphia. Her work spans numerous plans and built works at the University of Pennsylvania, planning and design initiatives along the Benjamin Franklin Parkway including the Rodin Museum, Logan Circle, and the Philadelphia Museum of Art’s Anne d’Harnoncourt Sculpture Garden, and most recently the award-winning transformation of Dilworth Park at Philadelphia’s historic City Hall. Susan will be honored at the 2018 AIA Philadelphia Design Awards Gala on November 7th at the Kimmel Center for the Performing Arts. For more information, please visit AIA Philadelphia.